Happy birthday mum! Happy early Father’s Day dad! So my parents are currently gallivanting around the west coast of Canada, and no doubt will be having a fabulous day celebrating my mum’s birthday. Before they toddled off, I issued them with their respective birthday and Father’s Day pressies to use on their travels. For my mum, I actually made this toilet bag last autumn, but for some reason it didn’t feel right to hand it over either at Christmas or for Mother’s Day, but for this birthday it was perfect. 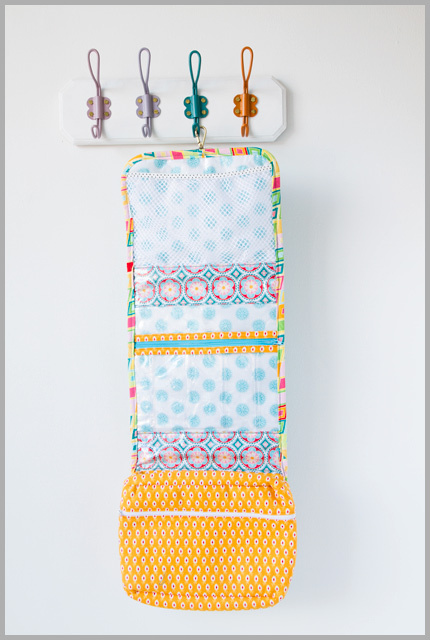 I’d been fascinated with roll-up toilet bags since seeing some in Nature Et Decouvert in Provence a few summers ago, and had pinned many commercially produced options with the thoughts of making one some time. I saw a Craftsy class with Annie Unrein which had a similar idea, so I thought I might be able to bypass writing a pattern for myself (being kind of short on free time right then). Having taken the class I decided I would take some of the ideas she had and run with it, mostly in a different direction, but it was a fabulous exercise in learning how I didn’t want to do it (and no offence to her, but we definitely have different technique preferences). Mine is also rather smaller, and a more suitable size for a toilet bag in my mind (I think hers was for make up rather than toiletries). Anywho, after all that, I liked my result, but if you want a pattern, go see Annie on Craftsy! I want to revisit this idea at a later point, but with different pocket arrangements and combinations. For the fabric I chose a line from a few years ago which I thought she would enjoy because of the holidays that they’d taken in India in the previous few years. For the lining I added fusible laminate so that it was wipe-outable if anything spilled in transit. I made the central zipped pocket pleated, so that it could accommodate more things than a purely flat pocket would, and I made the top pocket from mesh with an elasticated top and pleated bottom, again to allow for some flexibility of contents. The closure is a snap hook and D ring, bought for adjustable straps, but it works perfectly here! Again I reviewed a whole collection of different commercial options and did a kind of ‘best of’ set of features, so on the left there are 3 pockets, the front 2 of which are closed and tiered to allow for visibility of different sizes of travel document, and the back one of which is open at one side to allow for large papers such home printed boarding passes to fit in without having to fold them up too much. On the right the front 2 clear pockets were designed for driver’s licences, but would also work for passports, train tickets and the like. 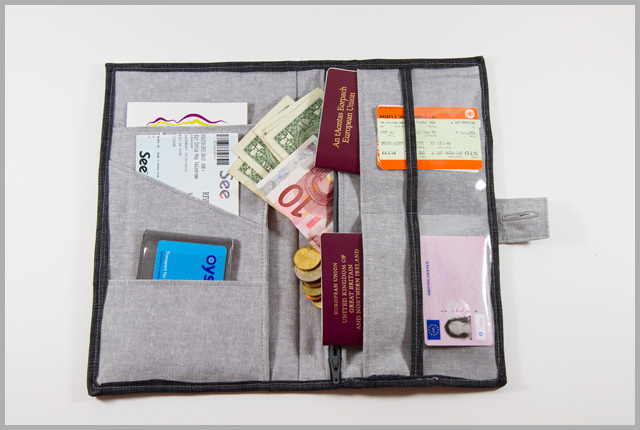 The middle row of pockets are for passports, and at the back is a zipped pocket for currency or anything else you want to keep extra safe. I will produce a pattern for this, including the applique for the front, and I’ll try and get it out to my testers in the next few weeks. I love your toiletries bag! I've been toying with the idea of creating a pattern for one myself, yours is perfect. You should write it up! Not surprised you're sulking, I have had to give in and switch the heating on, can't believe it. Oh, and I love both these projects, sure your folks do too. Katy, thanks for sharing the bag you made for your mother. It is always a pleasure seeing someone get inspired and make a pattern more suitable for their needs. I admire your ambition. I'm sure she is enjoying it very much! Lovely gifts ! Practical and beautiful.I bet both those presents are getting used to the max on your parents travels! Thank you for the birthday and Father's Day wishes. I'm glad we managed to Skype you successfully. We both love our pressies and they are fully in use. We're sorry about your weather. Here it's sunny today though it rained yesterday. We've just come back from the Butchart Gardens and we're in our upgraded hotel suite looking out as the car ferry, water taxis and float planes play chicken on the bay. 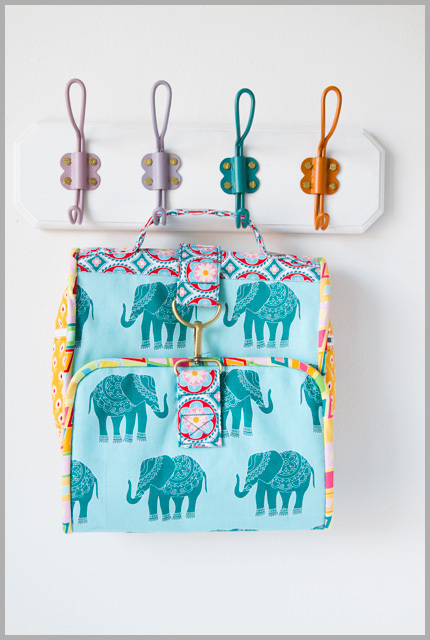 Indeed the toilet bag is perfect and I love the heffalumps, especially the colour of the fabric – one of my favourites! I think creating the pattern would be great idea too. 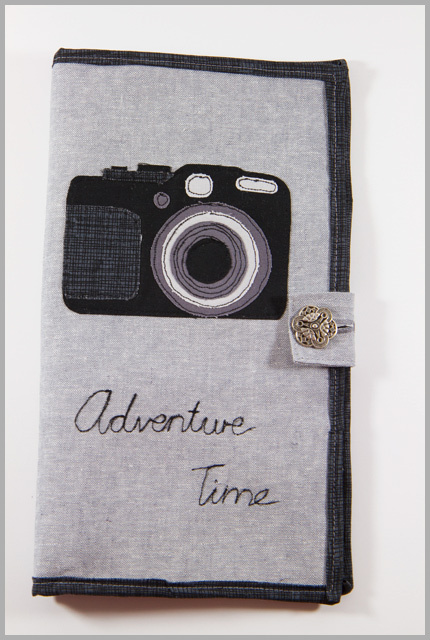 Brilliant, thoughtful gifts for your globe trotting folks! Those are both wonderful — and love the camera appliqué on your dad's!! Lovely presents! I hope your weather has improved. two brilliant presents, and useful is always a bonus. How does it work sewing the plastic?